Japan Economy Watch: Deciphering the USD/JPY - A Credit Turmoil Story? In a time where the USD continues its roller coaster ride and where analysts and other market sages are effectively predicting the USD/JPY to break 100 anytime soon I think it might be a good idea to have a more reflective look at what is happening to the JPY (the USD/JPY in this case). Of course, exchange rates, like the lord, move in mysterious ways and most empirical studies have grappled with how to say anyting useful about the trends and movements in exchanges at the same time as statistical tests have shown how exchange rates are best modelled by a Random Walk process essentially meaning that today's spot rate is the best predictor of tomorrow's ditto. In that sense I have to disappoint the punters who are expecting a model to predict short term moves in the USD/JPY. I haven't found one I am afraid. You could also ask yourself that if I really was sitting on a model to predict daily moves in the USD/JPY ... would I be posting the result here? 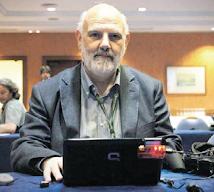 My objective on the other hand is to try to formalize one of those market pointers out there which everybody seems to be tuned into but which has not been operationalized. One of the most persistent features of the FX market since the beginning of the credit turmoil (I am putting the date at 1st Aug 2007) and arguably further back has been the steady unwinding of carry trade and thus by derivative the appreciation of the JPY and the CHF. These two currencies have been favorite funding currencies for the carry trade which exploits uncovered interest rate parity by borrowing cheap (low interest rates) and investing in high yielding currencies. In this immediate light the recent assertion of the JPY against the USD is not so strange. Since August 2006 the Fed has aggressively lowered rates while the BOJ has stood pat and as such the carry trade in USD/JPY is not at all the most attractive option out there. More importantly the JPY has assumed, and not only against the USD, a veritable canary in the coalmine mantle to become the main market gauge for risk sentiment. Conversely and as a parallel process the fundamentals of the Japanese economy have not materialised to provide what we could call traditional support for currency appreciation. Quite the contrary actually and presently most analysts are expecting the BOJ to come in with a cut in the main rate in Q2 2008. Paradoxically and under the current market conditions this seems likely to further strengthen the JPY. The gradual unwinding of carry trades are no doubt important here but the low-yielders' (i.e. CHF and JPY) role as risk measurement gauges is still quite interesting I think. It is this role that I am going to try to formalize in this post the context of the USD/JPY. For a very concrete image of what I am talking about the graph below is interesting. 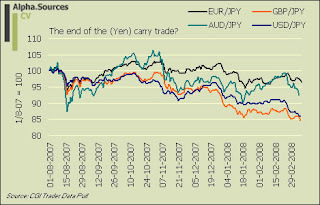 It plots the evolution of the JPY against four major currencies (although not the Kiwi which in this case would have been interesting) since the credit turmoil really began. The first thing we notice is the close correlation between these currency movements which further goes to highlight the main argument. Of course, there seems to be a break sometime in the end of January where the GBP/JPY and the USD/JPY continues to stay weak against the JPY whereas the EUR and AUD resumes their upward tendency, a tendency which has been reversed the last couple of weeks. Yet, this is well in accordance with the interest rate decisions observed in the Euro area and Australia have been decidedly more hawkish than those at the Fed and the BOE. However, behind all this lies still this point about how the Yen has become a way to gauge the immediate and essentially real time risk aversion in the market place. Moving on to the concrete aim with this note my method will be pretty simple and as the idea evolved in my head I was quite certain that the end result would not provide anything particularly interesting or 'significant' as we say in regression lingo. Yet this was not the case. In order to develop a Mickey Mouse model to show this 'risk gauge' role of the JPY I pulled the daily spot rates of the USD/JPY at market closing as well as the daily values of the SP500 and Nikkei also at close. The sample period runs from the 1st of August to the 6th of March (get data set here). 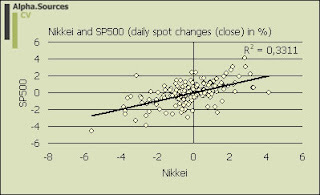 Reformulating the times series from level form to daily changes in % to correct for non-stationarity I regressed the daily change in USD/JPY on the daily change in SP500 and the Nikkei where the latter are used as proxies for risk sentiment in the market. The signs of the coefficient are expected to be positive. the USD/JPY is quoted indirectly and thus a 'rise' the currency pair value denotes a depreciation of the JPY. As such, the 'theory' or argument of JPY as a risk gauge would prescribe the change in the currency pair to be positively related with the change in the two stock indices. To set the scene I provide graphs of correlation analyses of the variables in question which give a good initial overview of the argument. As we can clearly see from the graphs above the correlation in the period in question is quite strong and much strong than I would have expected. For the USD/JPY and the SP500 the figure is 0.58 and for the USD/JPY and Nikkei we have 0.56. The last graph also deserves a little bit of mention even though it is of no fundamental value to the model estimated below expect that it indicates a moderate degree of multicollinearity. 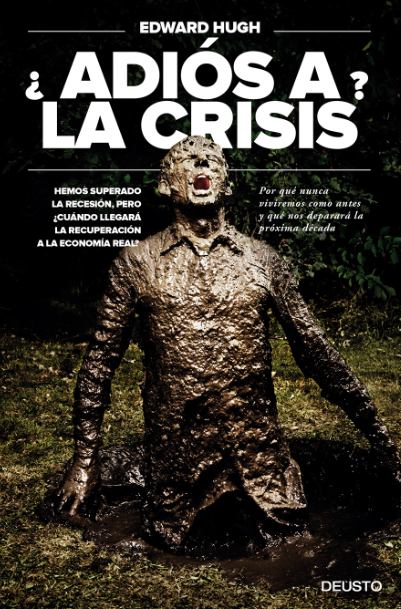 This is not entirely without importance since it underpins one of the peculiar and unlikable feature of international financial markets and investment allocation. As such, the benefit of international diversification traditionally arise from allocating funds across international markets to exploit the lower correlation (co-variance) amongst national and international stocks compared to investing in the national market portfolio. However, the rub is that during times of volatility and market uncertainty where international diversification would be most valuable covariance amongst stock markets tend to shoot up negating the effect to some extent. I don't have a rolling correlation analysis for the Nikkei and the SP500 but I would guess that it was less than the estimated 0.58 for the sample period in question (although please prove me wrong here if you have the data at hand). Having provided a rough description of the methodology I present the estimated model below. Where all variables are in daily changes in %. I want to stress that this model cannot be used to predict changes in the daily spot rate of the USD/JPY since there are no 'lead' or 'lagged' variables. As can be readily observed for those of my readers with a bit of knowledge of econometrics all variables save the intercept are significant at the 5% level. The R-square of .4075 (i.e. about 41% of the changes in the USD/JPY is explained by the changes in the SP500 and Nikkei) is fairly high in my opinion and much above what I expected before I ran the regression. The interpretation of the model is also straightforward if a bit pointless in the present context. 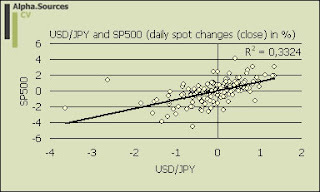 Consequently, a 1% daily increase in the Nikkei and the SP500 would translate into a 0.3% increase in the USD/JPY (i.e. depreciation of the JPY); all at close values. I think that this model conveys a quite strong message about one of the key current tendencies in FX markets today. One of the main questions however that emerges on back of this result would be the extent to which this tendency will linger? For the JPY to stay strong, the underlying assets in Japan need to be bought and held by foreign investors. However, there are significant cyclical and structural concerns about Japan that make us believe that USD/JPY cannot stay below 100 for long, though risk-motivated corrections could rather easily push USD/JPY below 100. We don’t believe that 100 is special, except for psychological reasons. This is exactly the point and, at least in part, we need to look at the long term ability for the global economies to create yield and positive NPV projects in order to understand where capital will ultimately end up as well as of course size and absolute market capitalisation also matter. Further down in today's MS bumper GEF issue Jen puts the forecast at 97 for USD/JPY in Q2 suggesting that the show is not over yet and not by a long shot. As I pointed out last week I agree although I am not going to venture an actual number. In the context of more tedious issues the model above and thus the approach could be improved by including a variable from the fixed income market but I did not have time to pull the relevant data mainly because I was not sure what to put in there. Moreover there is, as always, the question of causality. I don't like the traditional econometric tests (e.g. Granger) for causality since I think they do not really add much to the table in terms what exactly constitutes 'causality.' 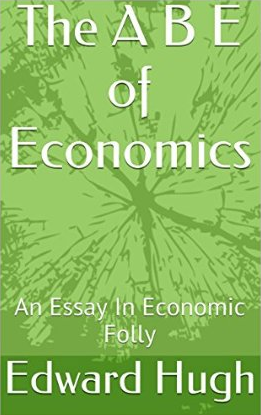 After all econometrics is just a tool to formalize and make rigorous what we are already seeing and or expecting as well as of course the pitiful endeavor of forecasting. So, what have I actually showed in this post? In terms of bringing new findings to the financial market place and economic punditry I have not contributed a whole lot. It is by now well known and incorporated in market discourses that the JPY and the CHF commands the role as global risk gauges at least to some extent. What is not known however is exactly how this can be operationalized. This is what I have tried to show in this post. Obviously, the nature of the study and the focus on daily spot rate changes leads to a focus on short term movements. What is equally important is the longer term trend and whether this role of the JPY will remain, get stronger or weaker. I am not sure to say the least. 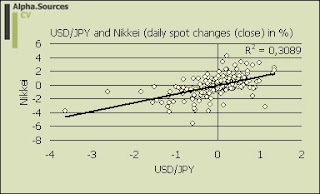 I believe that the curves will intersect at some point and that fundamentals once again will drive the JPY. However, there is also a global process of re-coupling going on out there (nope, it is not decoupling I am afraid) and in this context it is not yet clear what role the JPY will assume. Japan clearly exports much more to China and the rest of Asia than it did 10 years ago and this will lead to a process by which the US slowdown won't hurt as much as it would have. 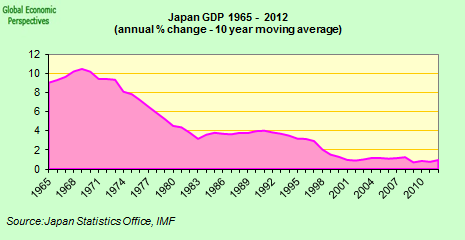 But, and this is the main point, Japan is still dependent on exports to fuel growth. In this light, the ever readable Emmanuel from the IPEZone has an interesting post about the probability of intervention as the JPY drifts towards 100 a buck. But now as I am converging on the point where I started this note I am also taking on a new topic and I will leave that for a later point.